Some call it freezing corn, some call it putting up corn, but whatever you call it, do it! 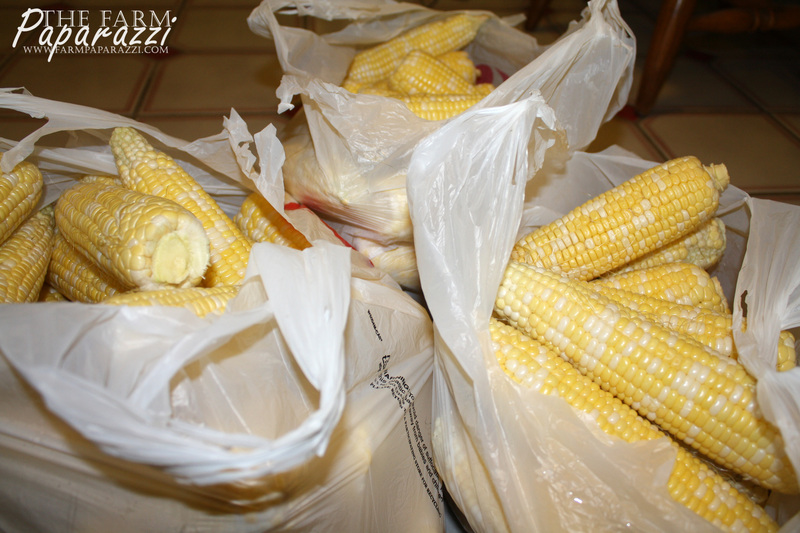 Last year my friend and farm wife mentor, Melinda, taught me how to freeze fresh sweet corn. I’ll never buy another bag of freezer-isle corn again! I put up a batch each of regular corn and creamed corn today. I’ll be finding bits of corn all over my kitchen and probably in my hair for the next week or so, but it’s totally worth it. I’ll teach you how to do it, if you want! Your life will never be the same again. Ok, here it goes. Are you all ears? After you’ve picked all your ears, or picked them up from a farmer, organize a shucking party and party hard. Then run the ears under water and clean off as many silks as possible. Get out your trusty electric knife and a shallow pan or dish. Melinda taught me to use an angel food cake pan and set the cob of corn on the part that sticks up in the center. It’s a stable place to rest the ear and all the kernels fall into the cake pan. I, however, do not possess an angel food cake pan so I used a shallow cake pan. Use whatever you have that makes sense to you. Now settle in for a good session of cutting corn off the cob. Don’t get in a hurry! Pay attention to where the blade is at all times. Your fingertips will thank you. Also, keep a dishtowel on your shoulder so you can dry your hands as you go. It’s harder to keep a secure grip with wet hands. 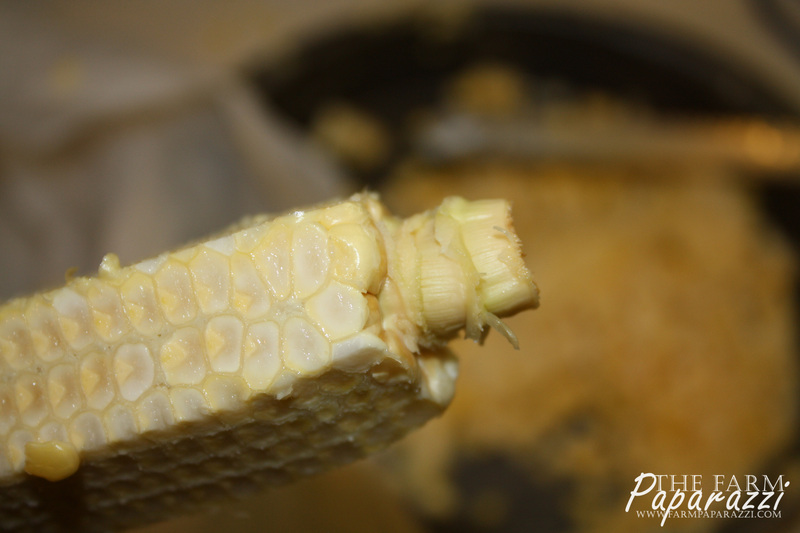 Holding the tip of the cob, cut as far down the ear as you can without hitting the pan you’re cutting on. Then hold the cob up and get the last bits at the bottom. 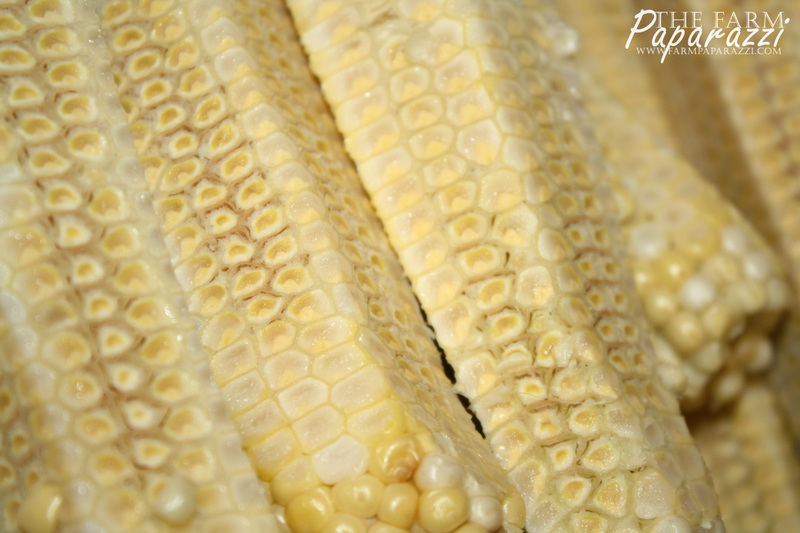 You want to cut deep enough to get as much of the kernel as possible, but try not to cut into the cob. 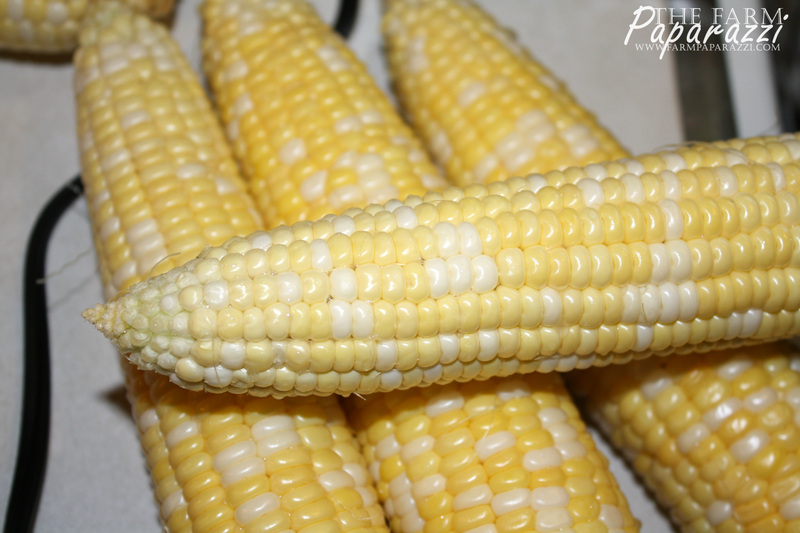 Your corn won’t taste as good with lots of cob in it. I like to leave the tip of the corn on rather than break it off. That way I have something to hold on to that’s a few rows down from where the knife starts. However, you definitely want to break off the bottom of the cob so it’s flat. If it doesn’t break off the way you want it, like the ear below, go ahead and cut the cob upside down so the ear is stable while you’re slicing. You don’t want to slip while wielding that electric knife! 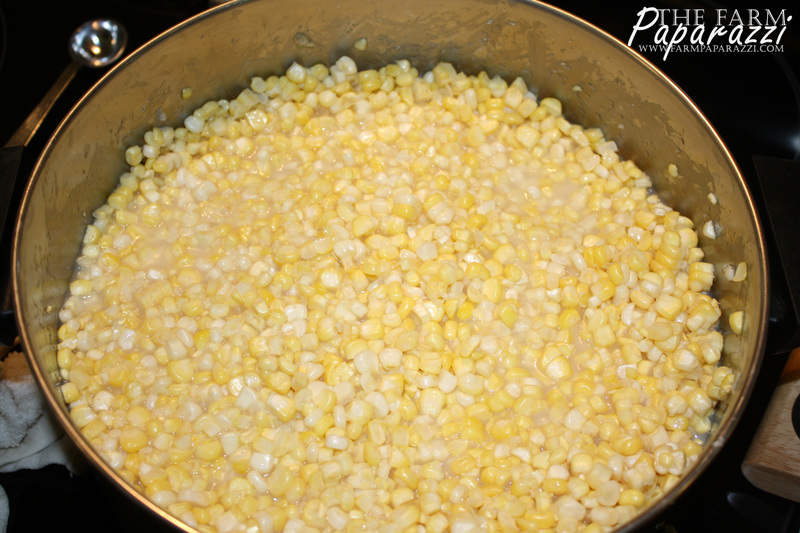 For regular corn, dump your pan-fulls into a large pot. 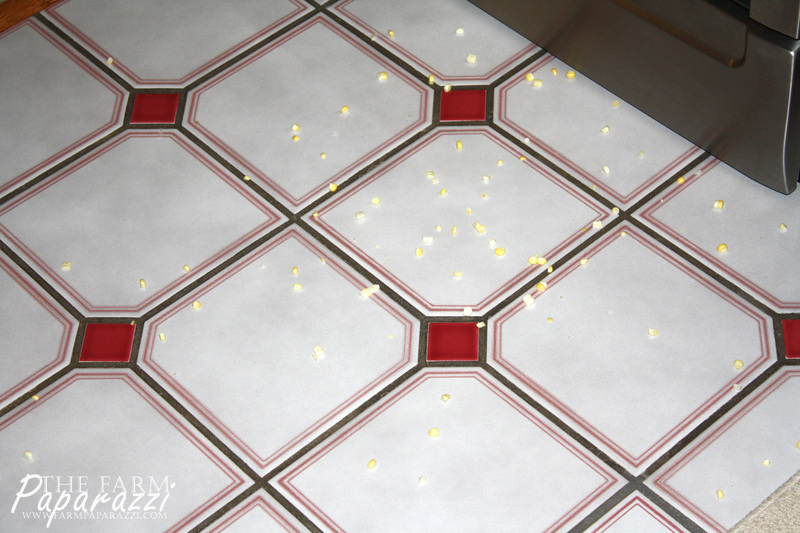 Try not to dump it all over the floor like I did. Do as I say, not as I do. After you’ve got a pot full, add 1 quart of water, 2/3 C sugar and 4 t of salt. Stir carefully so you don’t slosh it all over the sides. 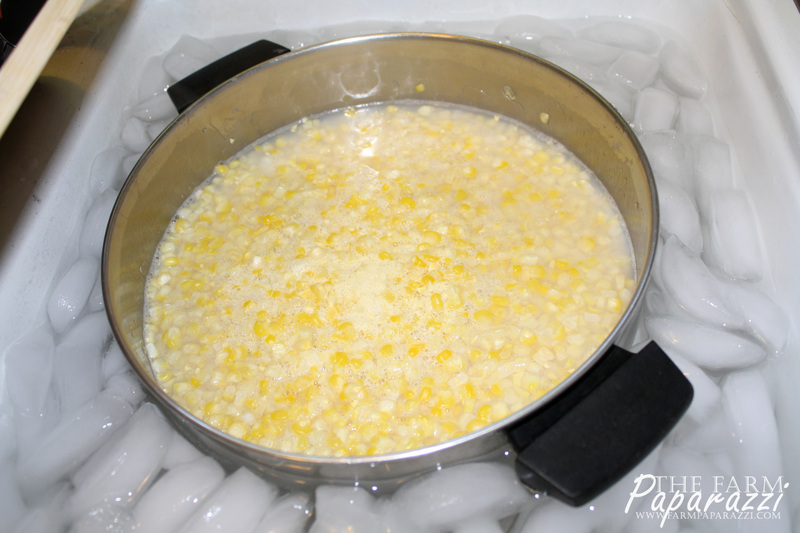 Bring the corn to a rolling boil and as soon as it starts to boil, take it off the heat and let sit, covered, for 10 minutes. While waiting, fill the sink or a cooler with ice. After 10 minutes, put the pan in the ice to cool. Go ahead and stir it every little bit to mix the cooler edges with the warmer center. Just be careful not to tip the pot or slosh the goodness over the sides. That would be tragic. 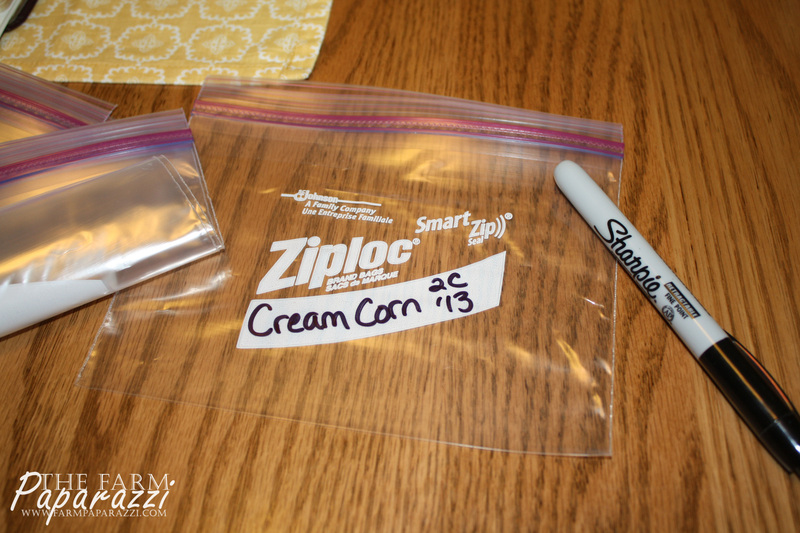 While your glorious concoction is cooling, label quart or pint freezer bags with the date, measurement and corn type before filling. 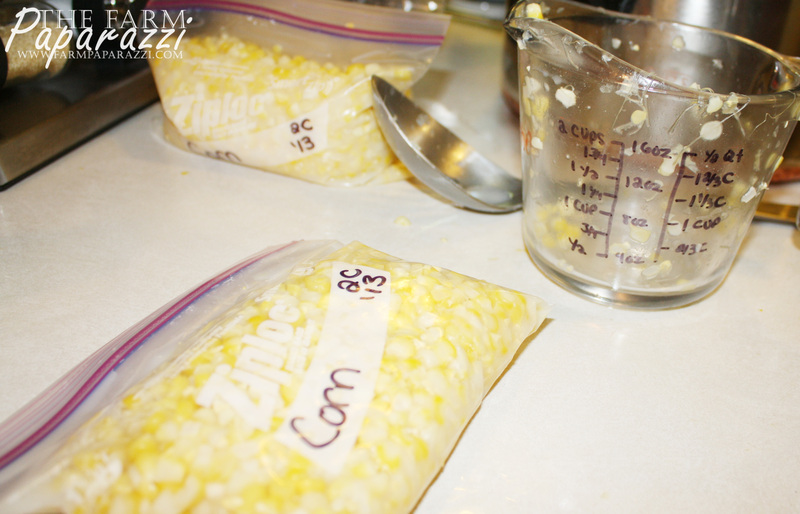 Once cooled, bag the corn, including the liquid, in equal measurements. Yes, the paint did come off of my glass measuring cup. And, yes, I did hand write it back on with a Sharpie. Who’s asking? The baggies can get kinda sticky so I wiped my bags down and stacked them in a box before putting them in the freezer. When it comes time to cook them, pull out your baggie to defrost and warm in a saucepan. Do not drain off the liquid when you serve it…that’s where a lot of the goodness is. 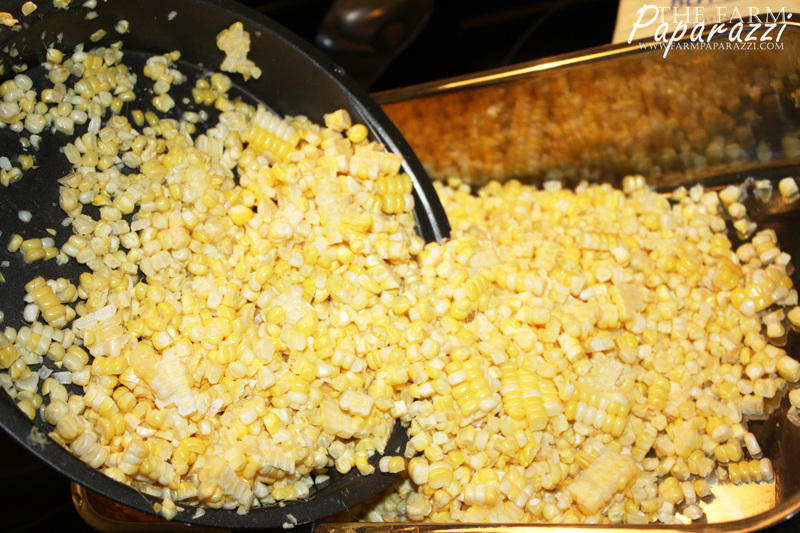 For creamed corn, dump all your cut corn into a large roasting pan. 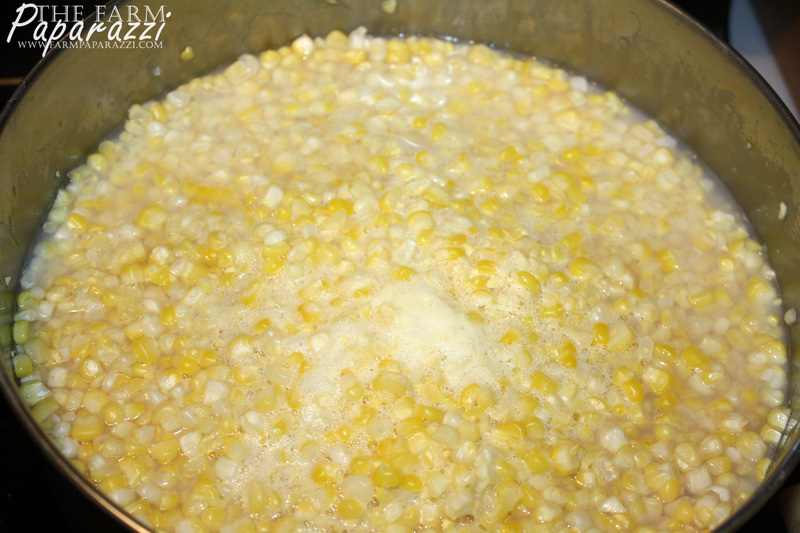 To your corn add 1 pint of cream, 2/3 C sugar and 4 t salt. Mix as well as you can without sloshing. Add a pound of butter, the sticks cut in half, to the top of the mixture. Cover your roaster with a lid or tin foil and cook in the oven for 90 minutes at 325˚F. Stir the mixture every 20 minutes. The butter will melt in nicely and your mouth will start to water. I won’t judge you if you take a spoon and eat some right out of the oven. Careful not to slosh it all over your oven while stirring. Not that I’ve ever had experience with that. When done, ice down and bag just like you did the regular corn. I shucked about 60 ears of corn for both recipes. 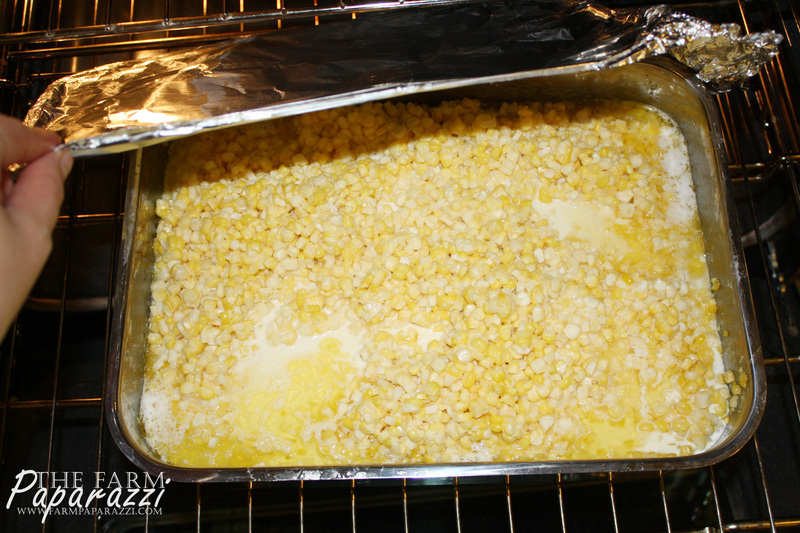 I did a little more creamed corn than regular, but all together it made 18 pint baggies at 2 C each. You can adjust the numbers depending on how much you need and/or want to share and how big your family is. And, yes, it is totally normal to have bits of corn everywhere. 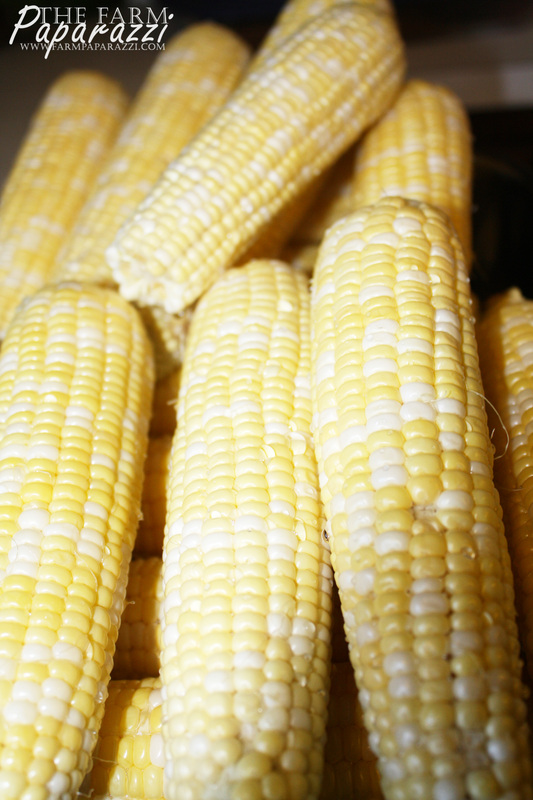 Shuck the corn. Wash ears and remove as many silks as possible. 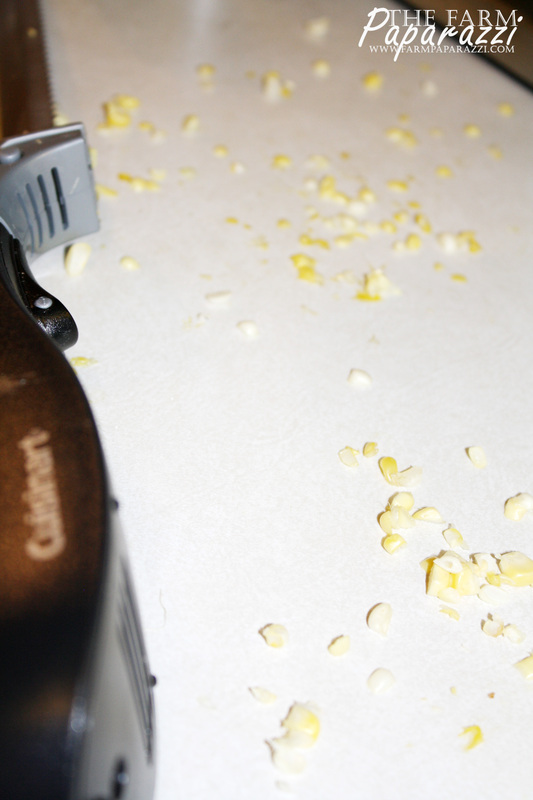 Using an electric knife, remove all the kernels into shallow pan or angel food cake pan. 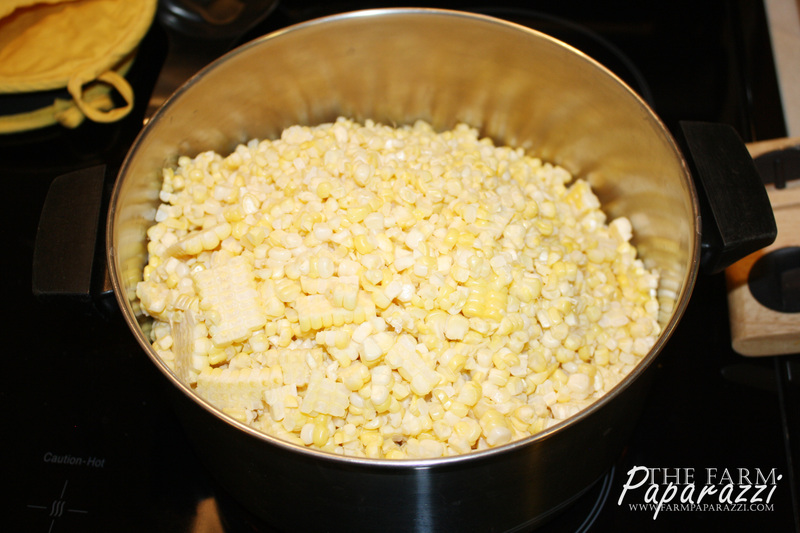 Fill a large pot with corn and add 1 qt. of water, 2/3 C sugar and 4 t salt. Stir as best as you can. Put on burner and bring to a rolling boil. Remove from heat immediately after coming to a rolling boil. Let sit for 10 minutes. While waiting, fill sink or tub with ice. Put the pan in the ice to cool. Label bags with date, measurement and corn type before filling. 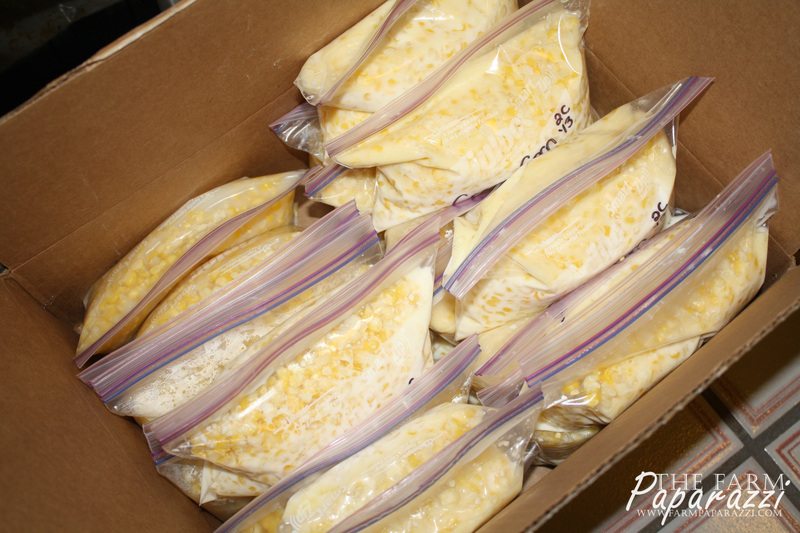 Once cooled, bag the corn (including liquid) in freezer bags with equal measurements (I do 2 cups each). Freeze. When comes time to cook, defrost, warm in pan and do not drain off liquid. 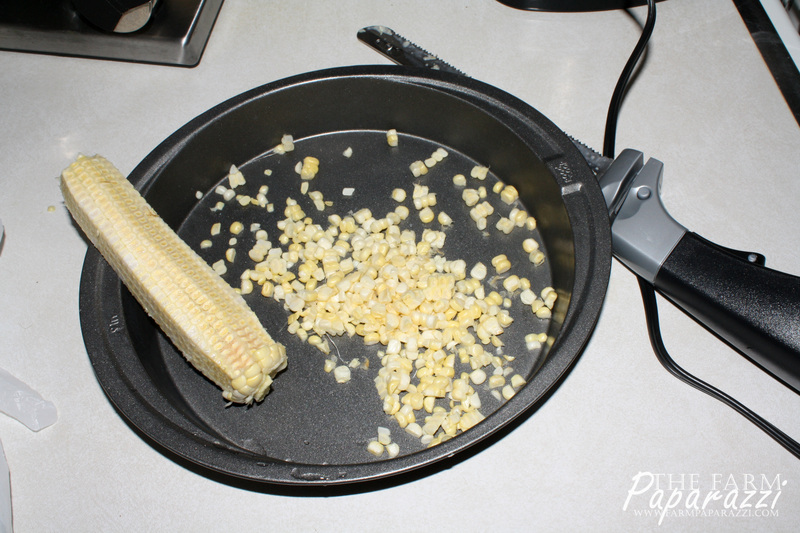 Fill a large roaster with cut corn. Add 1 pound of butter (sticks cut in ½), 1 pint of cream, 2/3 C sugar and 4 t salt. Mix as well as you can. Put in preheated oven at 325˚F, covered for 90 minutes. Stir every 20 minutes. Remove from oven and ice down to cool. 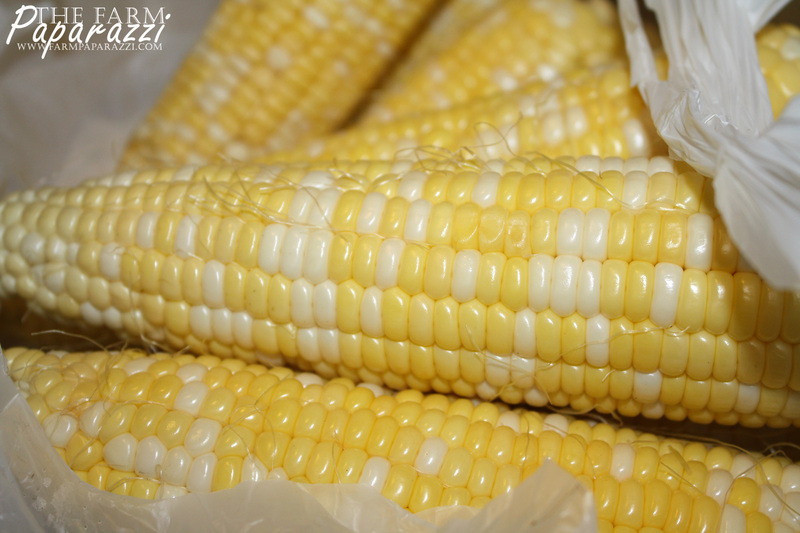 Bag the same as regular sweet corn. Ok, I knew you were awesome but really!! Sounds wonderful and reasonably easy. It looks like you can start filling my freezer now! I have to say the angelfood pan is brilliant. Lets you go all the say to the end of the cob in one fell swoop! I’ve pinned the post too! Thanks Janice! I’m glad you stopped by my blog. I checked you out too!